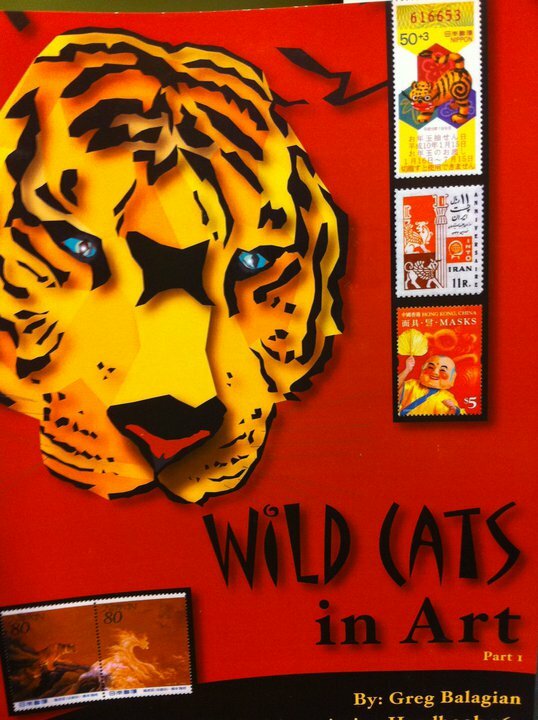 In 2011, with an enormous help of the Executive Director of the American Topical Association Vera Felps, my dream project – the two volume illustrated catalog/handbook “Wild Cats in Art” was published by Minuteman Press of Toledo, Ohio. The graphic designer for the handbook is Amanda Morgenstern, a young American philatelist with a BA (Honors) in Graphic Design and an MA in Typographic Design from Cambridge School of Art in the UK. The handbook 161 received excellent reviews in “Topical Times” and ‘Canadian Stamp News” magazines and it can be ordered from the website of the American Topical Association. Most recently the handbook was also issued in a digital format on a CD which also includes corrections, updates and additions to the original print version. The CD can be ordered from the American Topical Association as well. In the past few years I wrote number of articles which were published mostly in the “Cat Mews” – an award winning Journal of the Cats on Stamps Study Unit of the American Topical Association. This wonderful publication is edited by a true feline philately enthusiast Marci Jarvis, who masterfully prepared my articles for publication, rearranging them and making necessary corrections and improvements. All these articles displayed in this part of the website. Please click on the titles to view them in PDF format. The above article was originally published in the “Cat Mews”. This is the version translated to Armenian and published in 2011 issue 56 of the bilingual “Journal of the Armenian Philatelic Association” (Glendale, CA), and February 2011 issue of the “Armenian Philately” (Yerevan, Armenia).